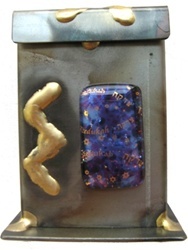 The word "Tzedakah" is etched into the fused glass in both Hebrew and English. Made from a combination of steel, brass and copper. 3.5" tall. Glass colors differ from piece to piece - no two are alike.